The best thing to experience in Mumbai is the indomitable spirit of the city. 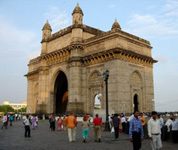 Beyond that, there are a host of tourist attractions to visit in Mumbai. In fact, no trip to Mumbai is complete without a walk down the Marine drive, a visit to Juhu beach, a photo session in front of the iconic Taj and feeling the seaside wind by the Gateway of India. There are of course other places to visit too such as Essel World, Aksa Beach and plenty more, apart from the famed night life of the city. Here’s some good news for you- visiting Mumbai has never been cheaper, thanks to MyMoneySeva. Be it flights to the city, rail tickets for intercity travelling, hotels, tour packages or something else, At MyMoneySeva, you can book all of that and be rest assured of getting the best price. In fact, we even have online mobile recharge service for travelers who don’t want to go looking for a mobile recharge shop. You can even buy cash cards for easier shopping in the city and even choose to pay bills online if you intend on staying in the city for long. Whatever the reason may be, if you are planning on visiting the financial capital of India, log on to MyMoneySeva and make all your travel arrangements- flights, rail, buses, hotels and everything else. We have the best for you in the most convenient fashion.